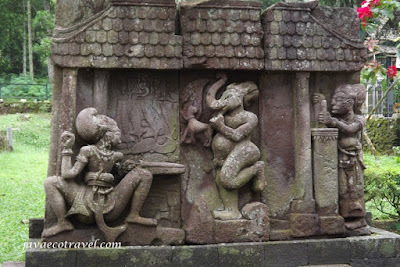 It was built at the dusk of the biggest Hindus kingdom in Indonesia. The era of a hegemony transition between Hinduism and Muslim religion in Java. The structure of the temple is deviated from the main pattern. Reliefs and statues are simply created as 'not proportional' reality, can be said cartoon like characters. This unique temple is known as Sukuh Temple. Located on the slope of the holy Mount Lawu. According to the legend, the last Hindus Emperor, Brawijaya V mokswa* on the top of this holy mountain. The temple was made as a place to purify the sin or foul. 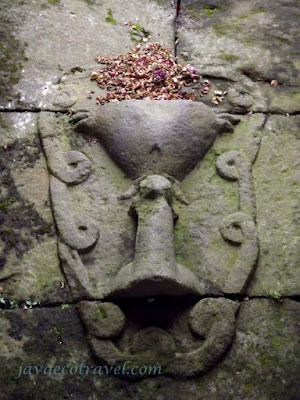 It can be seen from the two different stories found as a story panels at the temple. First group relief tell about Sudamala Story. 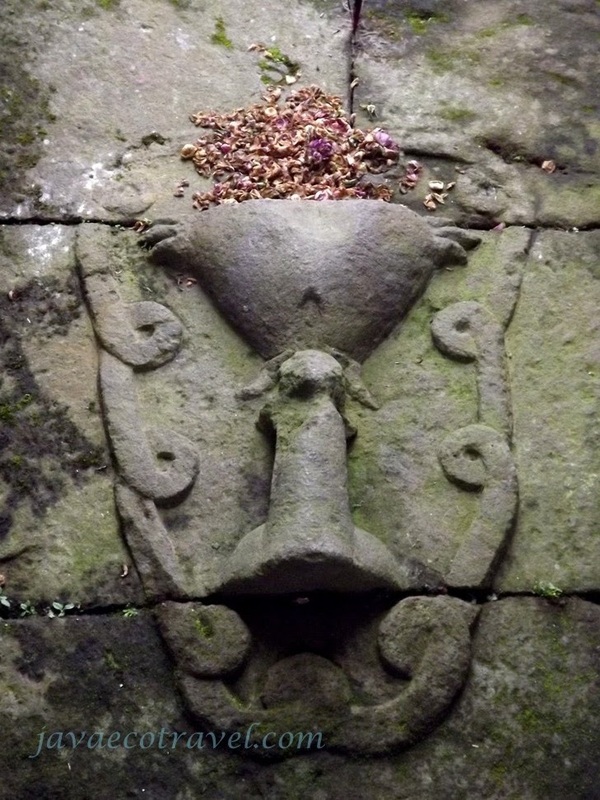 It tells about the struggle of Dewi Uma to release her body from the curse. Another group of relief tell about the story of Garudaeya who wanted to free his mother Dewi Winata from slavery. The main entrance, the gate, is consider as the place to purify the body and soul. As the pilgrimages entering the gate, they will cross the holy Lingga and Yoni relief (as the symbol of the birth of life) at the entrance floor, and then they will be reborn, all the sins will be purified. Another unique things from this temple is the dating method used by the architect of the temple on the 15 century. The reliefs found in front of the gate and at the exit behind are showing the era when the temple was built. This dating method called as "Sengkalan Memet" in Javanese culture. Every character and act done by the character have a number. From the relief of the gate can be translated into "Giant Gate Eating Child" or in Javanese languange "Gapura Buta Mangan Wong", Gate = 9, Giant= 5, Eating=3, and child or human = 1, Read the date in reverse become 1359 saka or if we convert to the international date is 1437 After Christ. 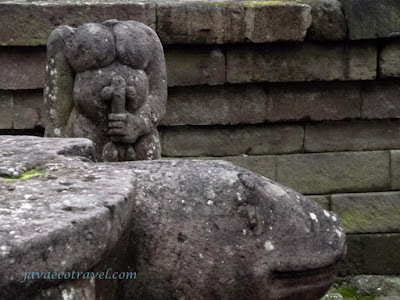 Sukuh Temple is one of cultural places in Central Java where people can learn a lot about the old culture of Java. There are still many undiscovered knowledge and interesting facts hidden in this small complex of temple. 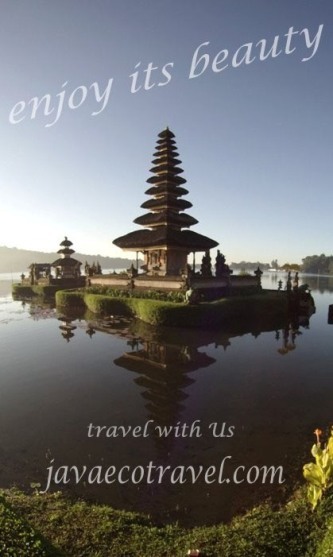 Please contact us Javaecotravel to arrange tour to Sukuh Temple. *Mokswa, Moksa (Sanskrit : moksha ) is a concept of body and soul transition in the Hinduism and Buddhism. It means to free the body and the soul at once. Its a freedom from earthly ties and also rounds off the reincarnation cycle.